Baseball: The Eric Searcy story - "It just takes one bad decision." Former UL baseball player Eric Searcy, submitted photo. The initial call was made on the first Friday of December in 1998. A second call — a tragic one, to his parents — followed hours later, early the next morning. Pitcher Eric Searcy had just been told by UL baseball coach Tony Robichaux he had made the Ragin’ Cajuns’ roster, and Searcy quickly phoned his father, Lawton. The accident left Searcy unable to walk, let alone stand on the mound, and three others in the vehicle in which he was a passenger injured, as well. The driver of the pickup truck that struck them? He was a repeat OWI offender who fled from the scene, served relatively minimal prison time and has been arrested on various charges several times since — as recently as this month. Flash forward almost 17 years later, and in early November another Cajun pitcher — Colton Lee — gets arrested and charged with operating a vehicle while intoxicated. He will serve an automatic one-year suspension, according to terms of Robichaux’s strict disciplinary policy. The Cajuns coach thinks back to the day Searcy was sentenced to life in a wheelchair, and he can’t stop talking. Searcy, from Baton Rouge, was supposed to pitch for LSU. He had already enrolled for classes there, and couldn’t wait to get started. Then a Tigers assistant coach who had been recruiting him delivered the news. He no longer was needed. UL didn’t have any scholarships left to offer, but Robichaux wanted Searcy as a preferred walk-on. He wouldn’t be guaranteed a roster spot, but could earn one. Eric and Lawton Searcy quickly found themselves driving west on Interstate 10 to meet with the man who had phoned. The chat went much like it does with all Cajun baseball recruits who visit UL. “It wasn’t just a 10- or 15-minute conversation,” Searcy said. “It was an hour long. Other options? Transfer, or quit. Searcy decided right away that UL was where he wanted to play. Searcy practiced through fall ball, then sustained a strain in the rotator cuff of his throwing shoulder. Still, Robichaux wanted him. The plan called for Searcy to redshirt the 1999 season, and play in 2000. Not long after Robichaux had told him he’d made the team, Searcy went out with friends. With his walk-on clinging to life, Robichaux added a new duty to his regular routine. “You want to talk about a man who cares? He was at the hospital every single day,” Searcy said. “I started playing baseball when I was 5 years old, and I never liked a single coach I had,” he said. “Couldn’t stand my high school baseball coach. I just thought, ‘That’s how it is.’ Coaches … just want to win games, and whatever it takes they’ll do it. But then I get to UL. Searcy said he broke the C4, C5 and C6 cervical vertebrae in his neck and severed his spinal cord. “I was on life support for a couple of months after the wreck,” he said. “They told me that more than likely I would always require the respirator. I couldn’t breathe on my own, so I had the tracheotomy tube down my throat breathing for me. Robichaux, nevertheless, coached him up. Searcy went on to graduate from LSU with a bachelor’s degree in business administration, and in 2008 he was awarded a master’s focused on healthcare management. He is a healthcare consultant at surgical facilities, and, along with a best friend, owns a couple Baton Rouge restaurants. Through his Eric Searcy Foundation, he talks regularly to teams, student groups and others about the perils of drunken driving and the sensibility of sound decision-making. “I had no plans to go back (to school),” Searcy said. 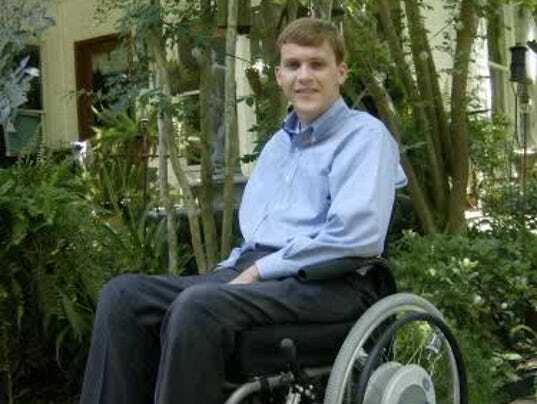 “I was a quadriplegic. “You know — what in the world can you do if you’re paralyzed from your chest down? Certainly there’s no job you can accomplish. Well, that’s the furthest thing from the truth. But there’s another reason, Searcy suggests, that it’s all possible. During the 2000 season — the one in which Robichaux’s Cajuns made their first and only trip to the College World Series — Searcy was with them much of the way. When UL traveled to No. 1-ranked South Carolina and upset the Gamecocks to punch their CWS ticket to Omaha, Nebraska, however, he stayed behind. But when the Cajuns flew back to Baton Rouge, Searcy was in the terminal, waiting near their gate — something permitted back in the pre-9/11 airport era. “When their plane landed and they … walked through the doors out into that big open room,” he said, “there was at least 20-to-25 reporters there, news cameras, everything else, and little ol’ me in my wheelchair. “I’m sitting in the back of the room. I mean, it’s as far away from them as you can possibly be in there. And when (Robichaux) walked in those doors, he made eye contact with me. It’s 2014, and UL has beaten Ole Miss in Game 1 of a best-of-three NCAA Super Regional at M.L. “Tigue” Moore Field. The Cajuns are one win away from a return trip to Omaha. Game 2 is about to begin, and Searcy is there. As it happened, the Cajuns lost to the Rebels in Games 2 and 3 of the Super Regional and were denied a repeat CWS appearance. They made it to a Super Regional again this year, but that time LSU denied UL. “Whenever they go again,” Searcy said, “I’m gonna be there. As Searcy sees it, though, it is Robichaux’s mere presence as much as — and maybe more than — pure talent that has allowed the Cajuns to get as close to Omaha as they have. “We had mediocre talent at best,” he said of the 2000 team. Same thing, he feels, for the 2014 and ’15 Super Regional clubs. “But look at how many games they win,” Searcy said. Every once in a while, one does not. Searcy asked about the details of Lee’s arrest, one of just two for OWI by a Cajun baseball player in more than 15 years, and whether an accident was involved. Relief can be heard in his voice. “You look at those teams — there’s not a person in the world that would say somebody with that caliber of talent should be where they are,” he said. “But, I’m telling you, it’s the character and charity and discipline that Coach Robichaux builds in his players that allows them to do what his teams have done. “There is no gray area with Coach Robichaux when it comes to what he expects out of you. ... There isn’t a doubt in my mind they get it. And you can feel it. All this from someone who practiced roughly three months for the man. Yet even today the two remain connected. Earlier this year at Alabama, Robichaux — who has coached 21 seasons at UL and eight at McNeese State — notched his 1,000th career win. Searcy, however, sees his old coach fighting for bigger victories. It’s the same reason he shares his story, and it’s why Robichaux frequently introduces him when the former pitcher speaks in the area. It’s worth it, he wants to say. “That’s what a lot of people don’t get, is it just takes one bad decision,” he said. “A lifelong of good decisions can be erased by one bad decision.